With the appropriate apps, you can turn your Android device into a versatile Raspberry Pi companion that can perform a wide variety of tasks: from monitoring the status of your Raspberry Pi-based server to remote controlling media applications running on Raspberry Pi. Other apps let you control Raspberry Pi's GPIO pins, which can be useful in all sorts of hacking projects. In this article, I cover a handful of apps that can transform an Android device into a flexible tool for managing Raspberry Pi. If you run Raspberry Pi as a headless server (i.e., sans display, keyboard, and mouse), a tool for monitoring its status can come in rather handy. Several monitoring solutions work with Raspberry Pi and Android, including phpSysInfo and the accompanying PSIAndroid app, RPi-Monitor, and Raspcontrol. Most of these tools must be installed on Raspberry Pi, however, which means you have to deploy, configure, and maintain additional software on your Raspberry Pi server. The RasPi Check app  provides a more elegant monitoring solution that doesn't require any additional software installed on the Raspberry Pi (the app only needs OpenSSH running on the server). Although the app is not as powerful as phpSysInfo or some other advanced monitoring solutions, it does provide a quick overview of all key aspects, such as system info, network interfaces overview, disk usage, and running processes (Figure 1). Along with the usual system information like uptime, CPU load, and memory usage, RasPi Check also displays the overclocking data, which includes CPU temperature and the current processor frequency and voltage. 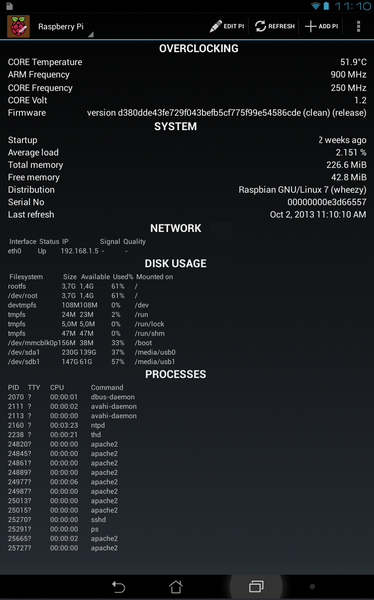 Figure 1: RasPi Check lets you monitor Raspberry Pi from an Android device. Using the RasPi Check app couldn't be easier. On the first run, the app prompts you to create a new connection profile based on the existing SSH credentials. Once you've added the profile, tap the Refresh button for RaspPi Check to collect and display the monitored data. The app can handle multiple profiles, which can be rather useful if you need to keep an eye on several Raspberry Pi machines. You can create a new profile by tapping the Add Pi button. Although RasPi Check is first and foremost a monitoring app, it does provide the Shutdown command, which lets you reboot or halt the Raspberry Pi server. RasPi Check is not overloaded with features, but it could be a perfect tool for the job if you are looking for a no-frills Raspberry Pi monitoring solution that is easy to deploy and use. RasPi Check is a simple app, but it's not the simplest one. The honor of being the most simple Android app for monitoring and controlling Raspberry Pi goes to RaspberryPi Controller . This app can do three things: check the availability of the Raspberry Pi server, reboot it, and shut it down (Figure 2). That's all the app does, but in many situations these actions might be the only ones you need to perform from your Android device. Figure 2: RaspberryPi Controller is a super simple app that can be used to check Raspberry Pi's availability as well as reboot and shut it down. As you might expect, using the app is very straightforward: Specify the required connection info and use the available buttons in the main window to perform the supported actions. Tap the Check button, and the indicator shows the status of the Raspberry Pi server – green means that the server is up and running; red indicates that the server is down or unreachable. If you need to reboot or shut down the Raspberry Pi server, you can use the dedicated buttons for that.